Many of us buy from big box stores or grocery store chains that have their products shipped from far away locations so they can offer us fresh produce and seafood even when it’s out of season for us locally. We can get tomatoes from Brazil, fish from the Northern Pacific, lettuce from California, and corn from Iowa. We have have asparagus any time of the year, not just when it’s in season. We can have peanuts and pecans on our schedule, not nature’s. According to some sources, the average meal travels over 1,500 mile before arriving on your dinner table. We like the benefits and variety afforded us by the current system. Eating what we want when we want is no longer considered a luxury; it’s become an expectation. Over the past few years, more and more people have began thinking about the source of their food. Although the variety and even the cost of foods on the shelves of the big box stores make it appealing to the average American consumer. There is an underlying cost and potential threat to supporting the status quo. Disruption. When we rely so very heavily on the supply chain and just in time inventory, what happens when one of the cogs that keeps food on the shelves breaks down? We are only one EMP or natural disaster from making it impossible for the supply chain to bring us the food we need. What will we do then? Increased Costs. Currently, the shelves of the big box stores are filled with relatively inexpensive food or food stuffs. Sure over the past couple of years prices have gone up while packages have decreased in size, but overall we live in a society where food is available to the thrifty shopper. But what happens when fuel costs double or triple and it’s no longer economically viable to ship food 1,500 miles to your local grocer? The local farmer was driven out of business years ago so who will supply our food then? Blights and Droughts. When much of our food comes from just a very few locations, it puts our entire supply at risk of disruption. What happens when a blight or drought affects the growing areas? Will we have the infrastructure locally to replace those items affected by nature’s cycle? Will we have enough food to survive until we can replace the production? A recent example of this is with the peanut industry and the price of peanut butter. Political Instability. There have been many changes to the governments of the world recently. The price of oil has fluctuated dramatically, affecting the price of fertilizers, transportion, packaging, etc. The current system’s food production is closely tied to oil. Legislative Interference. Today it is difficult for many small farmers to make it, not only due to global competitions and economies of scale, but also due in part to the knee-jerk legislation that makes it difficult for them to compete. Local suppliers help diversify our eating options. It’s been said that no society is more than three meals away from a revolution. That may be stretching it just a bit, but not by much in my estimation. Eating locally, while it may cost a bit more in the short run, will more than make up the difference in the long run. Supporting local vendors, eating the foods that God intended in a way that He intended, and not relying on a system on the brink of failing are all good. 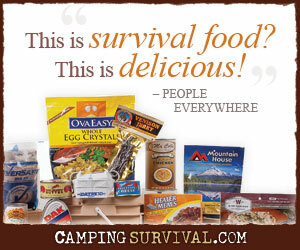 For the prepper, eating locally is more than just a political or economic statement. It’s preparing for an uncertain future by diversify our food sources to include those that are more sustainable and less dependent on a fragile system. In another post, I’ll discuss some actual ways we can eat more locally including growing your own food and shopping at farmer’s markets. Fortunately, it doesn’t get any more local than your own backyard garden! This past weekend, the three year old granddaughter of a friend of mine had to be airlifted to Children’s Hospital in Birmingham. They had been treating her in Montgomery and thought she possibly had ecoli. The doctors at Children’s determined it was due to two types of parasites in her body. They said that she had to eat or drink something that contained these parasites. She was some better yesterday and they don’t think she has any permanent damage from the cardiac arrest earlier. Her kidneys are beginning to function again and she is off the breathing machine. Her name is Karlie Gill. Her grandmother used to be in my Sunday School Class at Eastdale for several years. Please keep her in your prayers as she still has a way to go – not sure when she will be released.